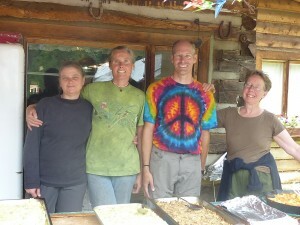 Dave Wells is a Friend from Tempe Monthly Meeting, a parent of Mountain Friends Camp campers since our first 2010 pilot program, a fantastic vegan cook who brought solar ovens to our 2013 camp, and a marathon runner too. On April 19 Dave is running the Wenatche Marathon in memory of two beloved IMYM Friends who have recently passed away, Carl Wallen from Tempe Meeting and Rebecca Henderson from Santa Fe Meeting, and as a fundraiser for Mountain Friends Camp. Thanks to Dave and an anonymous donor, all donations up to the first $1500 will be matched dollar for dollar, so give now and mark “marathon fundraiser” in the memo line to double your impact! We rely on donations from our entire community to help Mountain Friends Camp grow sustainably, and remain affordable for lower income families. All donations and pledges received by the end of April are eligible for the matching grant; for more information or to make a pledge, contact our treasurer Eric Wright. As one returning camper told me recently, “at Mountain Friends Camp, not only do I feel accepted for who I am, I feel cherished for who I am.” Won’t you help more young people come to Mountain Friends Camp, where they can experience a supportive Quaker community, enjoy simple outdoor living, and make lasting friendships? Thanks Dave, and we’ll all be cheering for you on race day!